Cruz Cabinet Shop designs and builds custom cabinetry for Dallas / Fort Worth Metroplex builders and homeowners. Since 1977 the company has been dedicated to providing the finest cabinetry for new and remodeled homes. From the beginning, the Cruz family has been guided by a simple philosophy ... to provide high-end quality cabinetry with innovative style. Our success has been based on referrals from our clients. 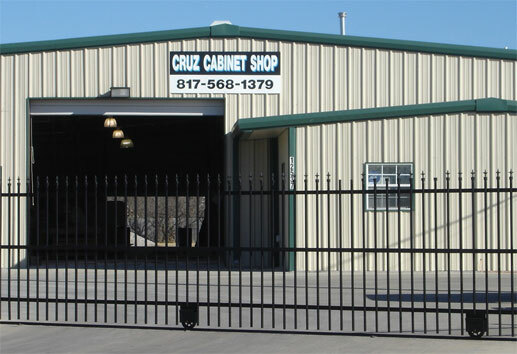 Over the years Cruz Cabinet Shop continues to utilize the latest cabinet design software and technologies. Customers can quickly review accurately detailed designs and enjoy fast economical results. in 2005, Cruz purchased an acre in Burleson, Texas and constructed a 8,500 square foot production facility. This expansion has proved to streamline operations and provide space for the best machines and an excellent work environment for our Production Team. These improvements have enable us to efficiently produce cabinetry without dramatically increasing product pricing. Our skilled craftsmen have joined our production team committed to excellence and customer satisfaction. They understand our family philosophy to produce the finest cabintery.